Iain Lobb: Go play Owl Spin right now! Hi Ian, just wanted to say I love the new game - it looks nicely polished and I think it could do really well on the iOS platforms (hope you kept the rights to do that). Also - any chance of sharing how you developed some of the curved levels, especially with regards to the collision detection etc. Anyway - well done, you should be proud! Thanks for the kind words mate. I still have all the rights, but I don't intend to port to mobile myself any time soon. I'd love to do a deal with another company to port it. 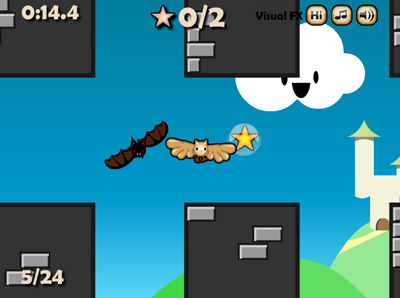 Collision detection is done with good old hitTestPoint - the owl's wings have 32 collision points on them that I check each frame against the level and any nearby bats. The level design can them be done straight into Flash. The levels are created by creating a shape and pasting it onto the grey shape and deleting it to create a void. Well done, Iain, I like how neatly polished everything looks and feels. Especially controlling the owl feels really smooth! Also interesting to see how you went about collision detection and level creation. Pretty straight forward. Hope the sponsorship paid at least some of the hours you spent on it, but I guess the most important point is to finally have something done, right? I'm going through the exact same process right now: cutting back on client work in order to do more indie development. First game is ready but not so much luck finding a sponsor... hehe. So I'm currently fixing it up for ports to mobile. Lots of obstacles to dodge but highly interesting! Isn't getting your very first game out the most exciting thing? Can't wait how it's all gonna turn out. Anyways, thanks for sharing, best of luck and keep up the good work!